PHOTO: Dr. Annie Kempers-Warmerdam, Philippe Roulet, Kurt de Mey and prof.dr. 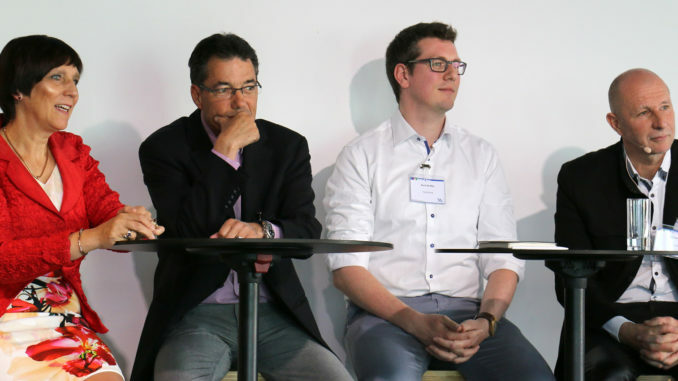 Filip Dochy in a panel discussion at the 2nd Annual Conference on the Future of Business Education in Packaging (FBEP2016). FBEP2017 will take place 20 April 2017. On Monday 14 November 2016 packaging exhibition ALL4PACK Paris will stage a unique debate sharing the latest insights on the future of the international business education in packaging. The 3:30-4:10 PM scheduled programme* will be presented on the TV-Stage and will be rebroadcasted on YouTube via ALL4PACK’s WebTV. NVC will be moderating the debate, commencing with the results of the 2nd European Conference on the Future of Business Education in Packaging (FBEP2016) that took place 21 April 2016 in Eindhoven, the Netherlands. Leading businesses and suppliers of international business education in packaging shared their insights at FBEP2016. Prof. dr. Filip Dochy (Leuven University) presented the results of a study performed among European businesses on HR development in packaging. Philippe Roulet (Nestlé) spoke about how Nestlé works on continuously educating and training employees in a large range of packaging jobs. Dr. Kempers-Warmerdam of the Netherlands Business Exam Authority showed baffling examples of diploma fraud in education programmes. In the afternoon, three different Round Table Discussions took place, addressing the most urgent education and training topics in the industry. FBEP2017 will take place on 20 April 2017. For all other issues you might be interested in, an NVC team will be present at ALL4PACK on 14 and 15 November 2016, so don’t hesitate to contact the NVC office if you would like to meet them at the exhibition during those days. NVC members can visit the exhibition and the TV-Stage with a free entrance ticket. Just contact NVC for the registration link and your free entrance code.